Taking the stairs is my go-to exercise. So, when I knew I was going to Paris, the one thing I knew I HAD to do was climb the stairs at the Eiffel Tower. Here's how that escapade when down or rather up...haha. I did some pre-planning before my trip and knew that you can only buy tickets for the stairs onsite and the recommendation is to get their either first thing in the morning when it opens are go late before it closes. I planned to take the early route since I'm a morning person. However, the weather in Paris wasn't on my side. I was there in late February along with the "Beast from the East". (No joke that was the name of the polar vortex that was setting in and bringing crazy cold weather.) The concierge at my hotel suggested I go the afternoon I arrived in Paris and not wait until the morning when things might actually be closed due to the weather front! Not having packed for that kind of cold, I put on pretty much all of my layers, bundled up in the winter coat that I did thankfully bring along and set out. From my hotel, the concierge said it was about 20-30 minutes. It was, however, a solid 35-40 minute walk. It's all pretty flat and a straight shot from my hotel, walking along the Seine or along one of the interior streets, which is what I ended up doing to stay out of the wind! And then it's there on the horizon and it almost doesn't look real. I was so cold at that point, that I decided to warm up in one of the many cafes dotting the blocks surrounding the Tower. The one I stopped at was called Brasserie de la Tour Eiffel. Once I could feel my fingers again and after the cafe and croque madame (yum! ), I felt ready to tackle the stairs. Once inside the fence surrounding the Tower, you head to one of the booths to buy the tickets. Again, not a lot of people lining up for the stair climb, so I got my ticket in no time at all. (The stairs only take you to the 2nd level. To get to the tippy top, you have to take the elevator. I decided that the second level would be just fine and it was!) Before entering the stairs, you go through another level of security. Here's a tip, try to avoid starting the stairs behind a school group. Makes sense that you'd want to go on a field trip to the Eiffel Tower, but once on the stairs behind a big group, there's no easy way to get around them. While there are several stairs cases, you use the same ones to go up and to go down. There about 700 stairs between the base of the Tower and the 2nd Level, and it's split somewhat evenly between the two levels. You can take it at your own pace, but remember what I said about big groups or just be aware if you have people behind you. There are signs along the way with info about how the Tower was built and historical tidbits, which are fun to read and a good place to catch your breath if need be. That said, the stairs are open air, so if you're not too keen on heights, this probably isn't the excursion for you. I'd suggest giving yourself a half day for the stair climb once you factor in getting tickets, going through security and making your way up and down. Could be shorter, but the closer you get to high season, I'd say the longer it's all going to take. Walk from Hotel Bel Ami to the Eiffel Tower. 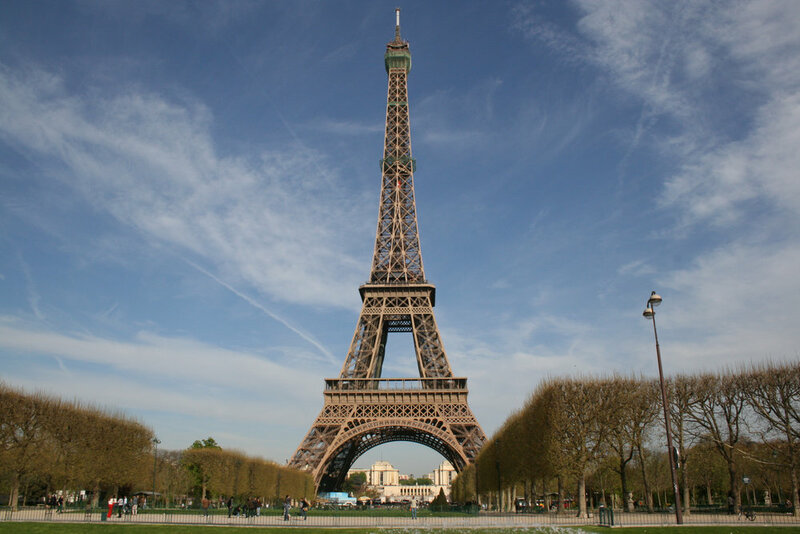 Have breakfast or lunch at one of the cafes like Brasserie de la Tour Eiffel. Take the stairs to the top...well almost...and then walk back. Take the stairs to the second level twice, so you walk each of the stair cases. Make sure to walk all the way around on each level.